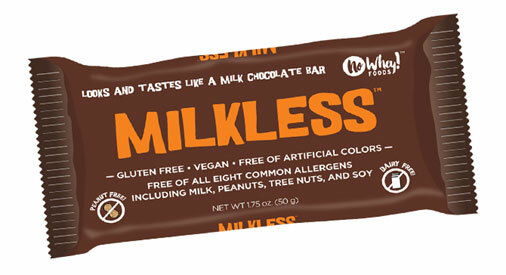 From the masters at No Whey Foods comes their amazing Milkless bar, which brings you back to the days of your favorite milk chocolate, but this one’s made without any dairy! Even better, it’s made in a dedicated allergen-friendly facility, so it’s also safe for those who need to avoid eggs, gluten, peanuts and tree nuts as well. But, while some allergen-safe chocolates are lacking in flavor, Premium Chocolatiers doesn’t skimp on flavor with their Milkless bar – it’s every bit as delicious and creamy as the milk chocolate you remember, and after your first bite, you’ll forget all about those “other bars” out there. 1.75 oz. (50g) bars are $2.49 each. From Joni of Aurora , Illinois on 7/30/2018 . I do not like dark chocolate at all. I have tried many varieties of vegan milk chocolate and I like this one the best so far. From Anonymous of Seattle, Washington on 3/7/2014 . So many unecessary ingredients! Premium Chocolatiers were on to something with their Polar Dream bars. Four ingredients, nice 'n simple. The ingredients list for a milk chocolate bar should mirror that of a quality dark chocolate bar, with the addition of a vegan milk product (I recommend coconut.) Raaka chocolates has a great vegan milk chocolate bar. Buy that, not this! From Hizl of Seattle , Washington on 2/9/2014 . I am NOT a sweets person…give me a nice crusty bread over a dessert every time but WHOA! This chocolate bar is absolutely delicious! Buy one and let me know if you disagree…you will NOT! From Anonymous of Raleigh, North Carolina on 2/4/2014 . This site sells many great chocolate bars, but this one is not one of them. It has a weird taste that made me not want to finish it.